amiQure Stress for Cats is a food supplement for cats containing high-quality natural ingredients to help your cat become less sensitive to stress in the short and long term. It is important to note that amiQure Stress is not addictive and has a non drowsy formula, so it can be used for long periods of time. Applications: Suitable for use against stressors, such as adapting, accepting (new additions to the family), aggressive behaviour, fear, hyperactivity, cat shows, nervousness, intolerance, travel, kennels, anxiety and destructive behaviour due to anxiety or stress, fireworks. How it works: Like all amiQure products, the stress formula is made up of a Multi-action system, fully focused on the cat's nervous system. Put about 2 cm (1.5 grams) of this paste on your cat's nose or paw to be licked off, or mix with your cat's food. Optimal effect should be reached after 3 weeks. Dosage may be halved after some time, provided that the condition does not worsen as a result. 100 gram tube of paste. Assuming average body weight (4 kg) and standard dose, a tube will last 2 months. 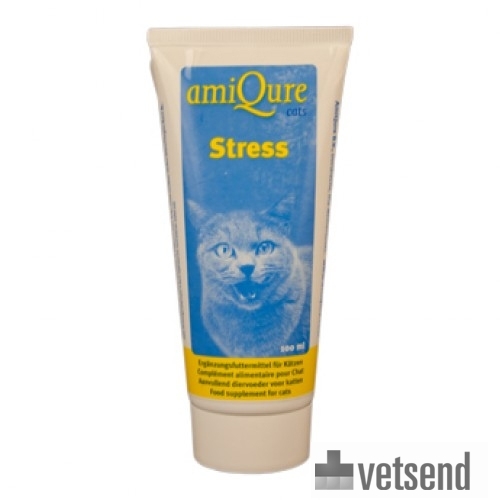 Have you used amiQure Stress for Cats before? Let us know what you think about this product.